After a long and stressful week, Jackson is finally home! 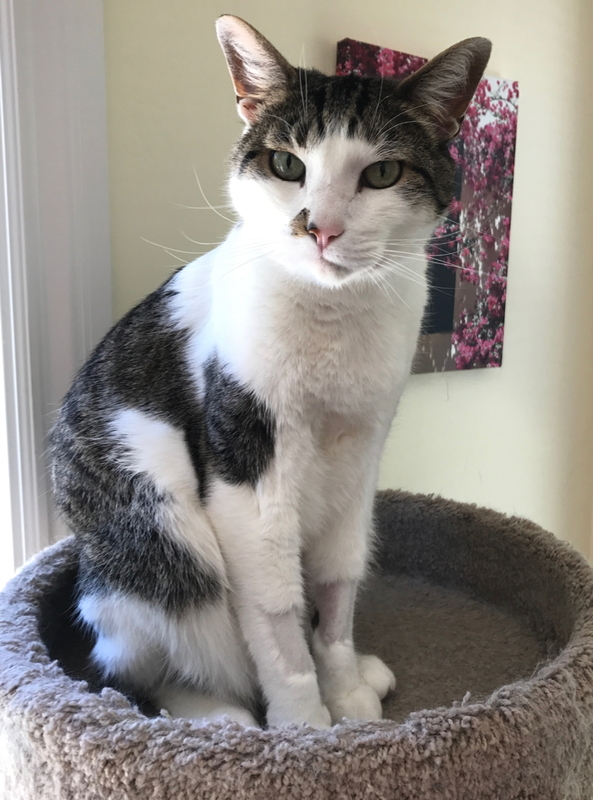 Wednesday the vet called to say that Jackson still hadn’t passed whatever it was, and recommended we take him to another, more expensive, vet – a.k.a., the hospital – since they had both an ultrasound machine and the capability to do surgery if necessary. 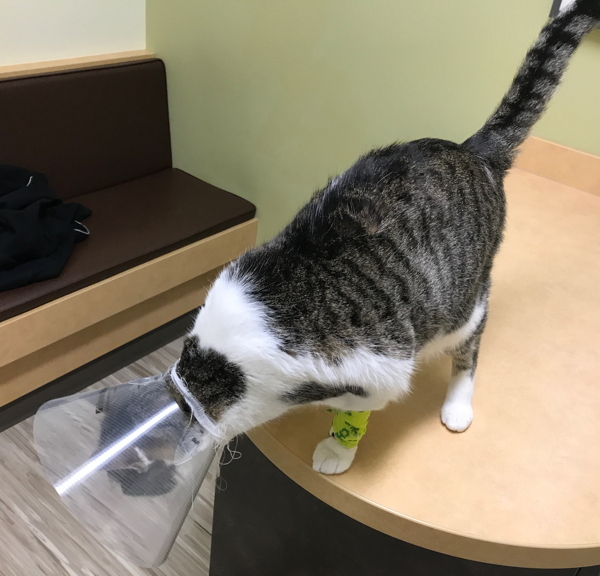 So I picked up the little troublemaker – who had an IV needle in one paw and a cone over his head and drove him over. At least, he was very excited until it was time to say goodbye so he could go in the back. And I could go to work. Thursday they called to say that they’d given him an enema (which I bet he loved!) and that he successfully pooped out – a hair tie. Which is kind of what we thought it might have been, although there was a chance it might have been a Lego-like brick. They suggested they keep him for one more night to make sure he was fully recovered. So Friday I left work early to go pick him up. It was, like, 95°F outside, and he meowed the whole way home. He came right out and checked out the house when we opened his carrying case, and then he spent the next hour or so grooming himself all over (the details of which I’ll leave to your imagination). Since then he’s been, well, I’d call it subdued. Not lethargic, but not completely back to normal. But he’s been eating, not throwing up, and mostly acting like his normal self. And very happy to be home – probably even happier than we are to have him home! He may be a little bundle of trouble, but he’s an important part of our household, and we missed him.